The study abroad experience is a wonderful opportunity for your student to develop confidence and selfreliance. While abroad, he or she may need to learn a new transportation system in a different language, negotiate new customs and expectations, and travel independently. Doing so encourages students to cultivate the necessary problem-solving skills that will allow them to recognize their own potential and capacity to be an independent adult. However, this personal growth starts before your student sets foot in a new country. Allowing your student to navigate complex pre-departure processes on their own, such as applying for a visa and determining a satisfactory flight itinerary for traveling to their host country, is an important part of preparing your student to live abroad. We hope that you will support your student and encourage him or her to take independent initiative in completing important steps in the study abroad process. Doing so will help your student get the most out of this valuable and transformational part of his or her educational career at Saint Mary’s. 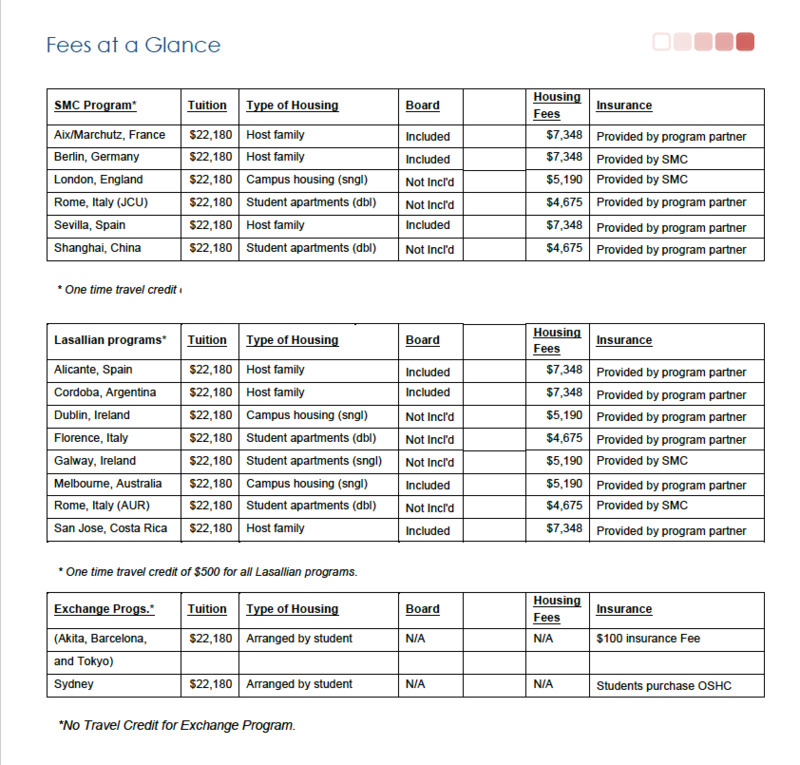 For more information on program fees, please visit the study abroad program page or refer to the Program Fees at Glance**. Students who currently use TMS Management Services Monthly Payment Plan can use the plan for SMC, Lasallian Consortium, or Exchange study abroad program fees. The Fall and Spring invoices will disseminate by the Business Office in July and December respectively. Student Loans as well as Financial Aid Awards (Federal, State and SMC) may be used to pay for SMC, Lasallian Consortium, or Exchange study abroad programs fees. Financial Aid awards will be distributed based on the SMC academic calendar. Personal expenses are estimated to be between $2,500 to $5,500, according to individual spending habits. Your student should take a realistic look at what he or she spends on campus in a semester and add expected expenditures for travel and leisure. Please use this Estimated Budget Sheet to discuss what possible expenses that can occur abroad. Meal coverage varies by program. Program pages list if meals are included in the study abroad program fees. Your student should review his or her program for specific details. Homestays: programs with host families have breakfasts and dinners included Monday-Friday. Every day lunches and dinners are at the student’s own expense. In these instances, we recommend a budget of $80 per week. Apartments/Dorms: students will have access to a private or communal kitchen and will responsible for preparing their own meals. We recommend a budget of $150 per week on groceries. Most students will be informed of the books they will need to purchase once they have access to their syllabi on the first day of class. Students should budget $480 for textbooks. Some excursion fees may be included in the cost of the study abroad program. Students should, however, anticipate some out-of-pocket costs for excursions. Depending on the program, students should budget around $150 per semester for entrance fees. Students often want to travel outside of class. Program fees do not cover independent travel expenses. Students are responsible for independent travel, accommodation and meals. Depending on individual plans, around $2,000 per semester should be budgeted for personal travel. Communicating from overseas can be very expensive. Students should not expect to use their hosts’ telephones. Most students meet their communication needs with cell phones, prepaid phone cards and/or Skype. Students receive information on purchasing cells phones and calling plans during in-country orientation, but should anticipate paying $150 or more for a cellular phone (including calling minutes.) Keep in mind that cellular phones from the U.S. will probably not work overseas. Many students purchase a phone upon arrival. Your student should budget for personal needs including laundry, dry cleaning, toiletries, personal hygiene, postage, and miscellaneous supplies. Your student may also want to budget for luxuries such as movies, taxis, and entertainment. Costs overseas will be comparable or higher than the prices in the US, depending on the country. Buying American brands overseas can be very expensive. Depending on your student’s spending habits, he or she may want to budget between $1,000 and $1,200 for incidentals. In case of an emergency, students should include extra funds that are readily accessible. Before traveling abroad, students can get the currency of the host country from their bank or exchange money at the airport. ATM cards and credit cards are the most convenient way to access money overseas. However, we recommend students check with their banks to find out how much they will be charged for transaction fees. If your student does not have a credit card or access to an international ATM network, there are other options. • Western Union will transfer cash abroad and charge it to your credit card. This can be very expensive and fees vary. • If your student has a local bank account in his or her host country, you can wire money to your student. There can be substantial fees for both the sender and receiver, and transfer can take anywhere from two days to several weeks. Your student must inquire at the bank about arrival of funds as banks will not notify your student when money arrives. • If you and your student are American Express members, you can pay for a money transfer with a major credit card. Your student can receive the transfer at the local American Express Office in his or her host country.